Pools are for icing too. As you know I am a big fan of ice baths. Ice is great after a long run to decrease pain and inflammation in your legs. Long or hard runs can create micro tears in muscle fibers, which leads to the soreness and stiffness you may experience the next day. Not to mention the tendons and ligaments of your hip, knee, and ankles has absorbed a significant amount of stress. 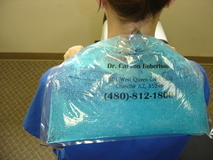 It isn't realistic to get daily massage or ice every inch of your legs with an ice pack. But an ice bath is an efficient and effective way to take care of your legs pos run. In Arizona we are blessed with wonderful ice baths in most back yards. There is nothing like grabbing a mug of coffee and wading into your pool. After the initial shock, the cold disappears and numbness sets in. For some reason, I use the pool more in the winter than I do in the summer. I may not float in the pool during the summer, but I soak in the winter. Staying in the pool for 15 minutes is a very efficient way to decrease inflammation and soreness in your leg muscles. The cold water decreases inflammation pathways in the muscles, tendons, and ligaments that just carried you for several hours. Several days of ice baths will help your legs recover faster and reduce potential injuries. Treat your legs to a dip in the pool after your next winter run.